WheatCrispr uses the Doench on-target and off-target scores, along with information about the location of off-target hits (coding, intronic, intergenic, etc.) to produce a single overall score for each sgRNA. By default, detailed information is displayed for the ten highest scoring sgRNAs to facilitate rapid identification of the most likely candidate sequences. An interactive interface allows the user to browse all other sgRNAs if desired. Polyploidy presents a unique challenge to sgRNA selection as the high similarity between homoeologues results in a greatly increased chance of sgRNAs targetting multiple homoeologues. Depending on the nature of the experiment this may be desired or it may not. WheatCrispr supports two overall scoring schemes, one that favors sgRNAs that target only the queried gene by treating off-target hits in homoeologues as it would any other gene, and a second that targets all homoeologous genes by rewarding off-target activity in homoeologues. Select the grna target: the coding regions of the gene, or the promoter region, defined as 2kbp upstream of the gene. 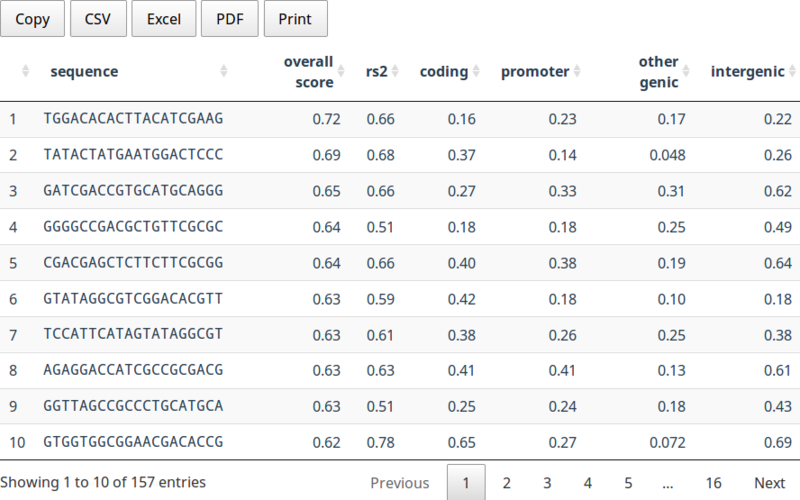 By default, offtarget hits to homoeologues penalize the overall score, as with any other gene. Select this box to adjust the scoring scheme to reward offtarget hits in homoeologues. Start by entering the name of any gene here. This must be a IWGSC annotation v1.0 or v1.1 identifier, for example "TraesCS3D02G273600"
Paste a DNA sequence. This must be just raw sequence, no fasta headers or other characters. If this box is left blank then the overall score will be calculated using a method that treats homoeologues like any other gene, preferring gRNAs that are unique to the selected gene only. If this box is checked then the scoring scheme is adjusted to reward offtarget hits in homoeologues while still penalizing all other offtarget hits. The RS2 (ruleset 2) scores measures the predicted cutting efficiency of the gRNA. This is a function only of the gRNA sequence itself plus a small flanking region on either side. The score ranges from 0 (no predicted activity) to 1.0 (maximum activity). 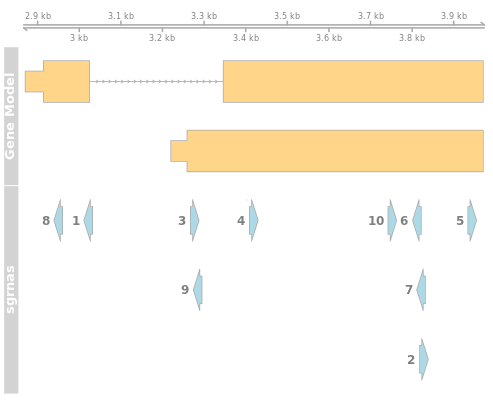 The CFD (cutting frequency determination) score measures the predicted cutting efficiency of an off-target sequence relative to the on-target sequence. This score ranges from 0 (no predicted activity), to 1.0 (full activity, ie. equal activity to the on-target site). An off-target site with identical sequence to the on-target site will therefore always have a score of 1.0. Note that when the "Target Homoeologue" option is enabled that the maximum CFD scores will be adjusted to show the maximum CFD score outside of a homoeologue. That is, the table always shows the "worst" CFD score. 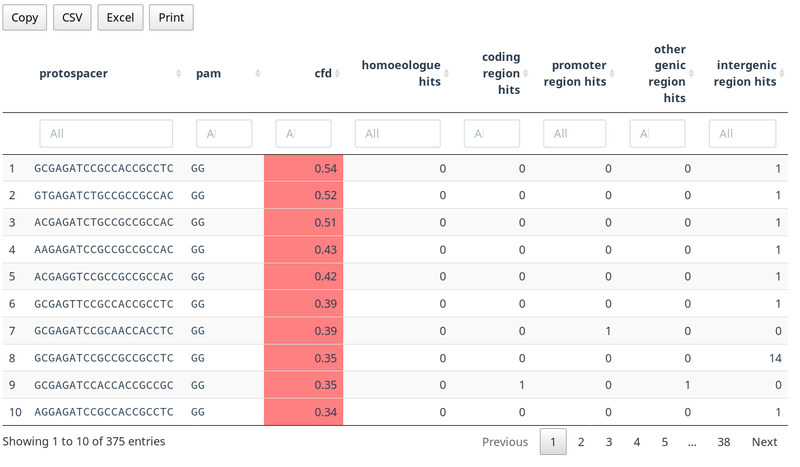 Clicking on a row while open a new table below that displays the set of all offtarget hits for the selected gRNA. This plot displays a visualization of the scores found in the table, plus the score for any offtargets hits to homoeologues. 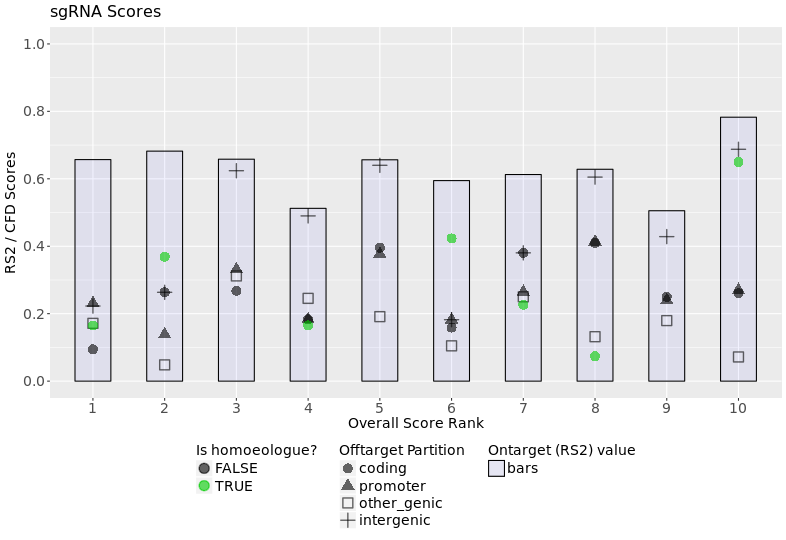 The blue-gray bars shows the RS2 (ontarget) score, the black points indicate the worst CFD scores for each region (coding, promoter, other genic, intergenic), and the green points, if any, show the CFD scores for homoeologues. The genomic region, one of "coding", "promoter", "other genic" (UTRs and introns), and "intergenic"
The gene plot displays the physical location of the gRNAs against the gene models. Each row in the gene model represents an isoform of the gene. The gray lines are introns and yellow bars exons. The thinner bars indicate UTRs.